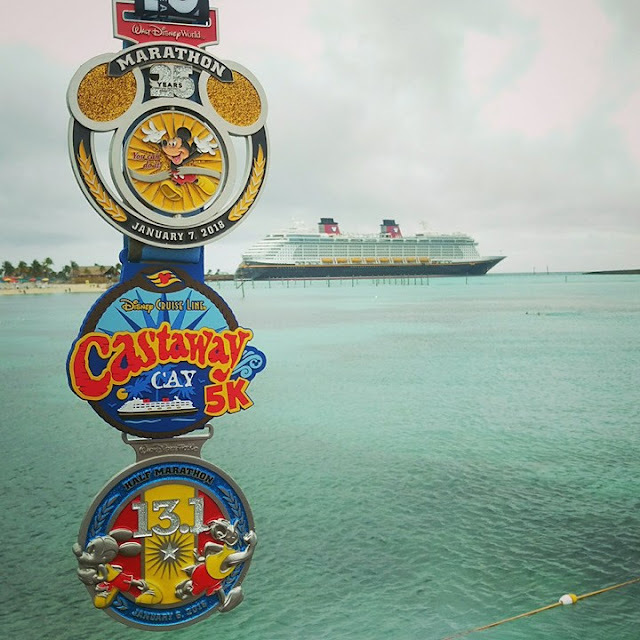 Last month, the day after the 2018 Walt Disney World Marathon, Matthew and I boarded the Disney Dream to complete the second half of our WDW Marathon Weekend trip: a four night cruise to Nassau and Castaway Cay. 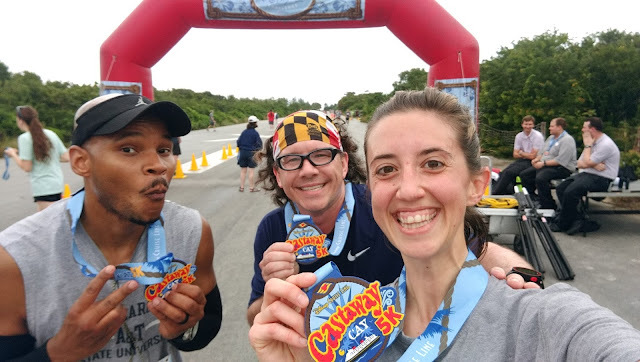 As you may recall, Matthew and I decided to book the Castaway Cay Challenge cruise in late October so we'd already missed the registration for the official Castaway Cay Challenge race. A little background (because this can be confusing, lol)- to run the Castaway Cay Challenge (a race that takes place at 7:30 am on Castaway Cay, Disney's private Bahamian island), you must register for and run at least one race during WDW Marathon Weekend, book your room on the Disney Dream for the cruise directly after the marathon, then register for the Castaway Cay Challenge race. 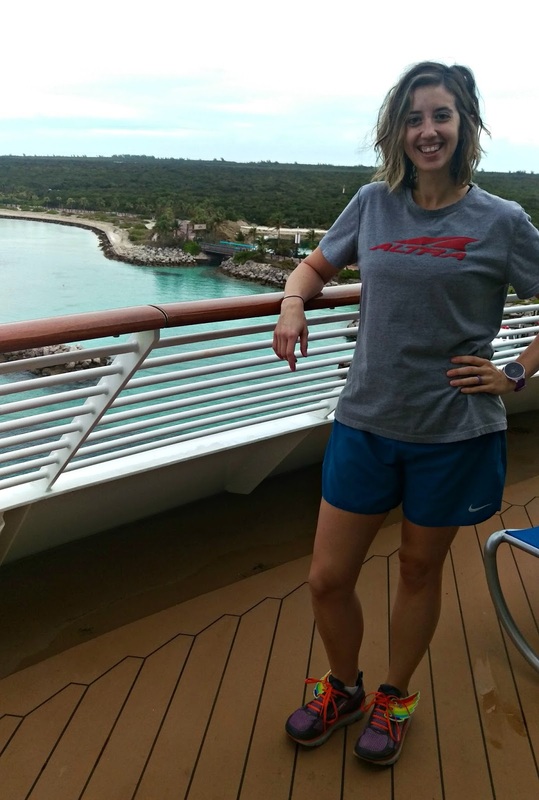 This race was sold out by the time we booked our room on the cruise so we opted to do the "free" (included in the cost of your cruise) 5k at 9 am, directly following the official challenge race. 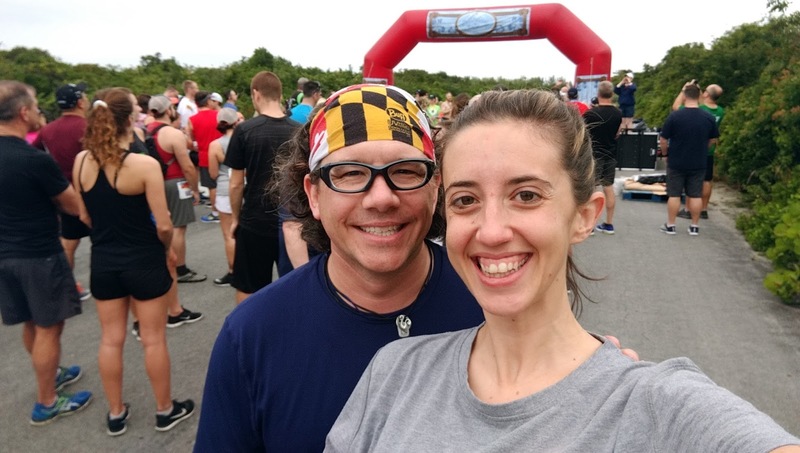 In essence, we were doing the challenge- one or more races at WDW Marathon Weekend + a 5k on the island- we just weren't doing the official race with the bling, the shirt, and the earlier start time. 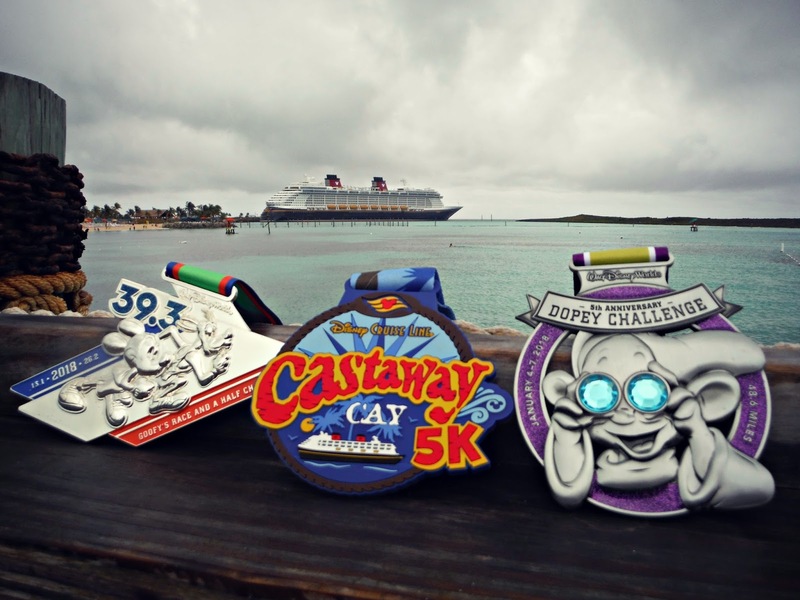 We did the official Castaway Cay Challenge last year and while we loved the race, we were ok skipping all the extras this year. Ok, back to the recap! Monday morning, our muscles still aching from the marathon the day before, Matthew and I started the most favorite part of our trip- cruising on the beautiful Disney Dream! Our first two days on the ship (embarkation day and Nassau day) were spent how we usually spend them- lounging around and enjoying all the Dream has to offer: we tried out the Rainforest in Senses Spa, had dinner at the adults-only restaurant Palo, swam in the Quiet Cove pool, did a Whiskey Tasting (which was super cool, by the way! ), met lots of characters, and enjoyed coffee on our giant verandah each morning. This is maybe 1/3 of our verandah deck. The morning we docked at Castaway Cay, we were up and on our verandah by 7 am. We actually were able to hear music from the start line about three quarters of a mile from where the ship was docked. Around 7:30, we heard the race begin and I can tell you will all honesty, I had absolutely zero FOMO (fear of missing out). Matthew and I chatted, sipped coffee, and then went down to Evolution (the biggest bar/club on the ship) to get ready for our race which would begin at 9 am. Just chilling on our deck with a private island behind me, NBD. Matthew and I at the start of the "regular" Castaway Cay 5k. Because the challenge runners used a different course than the regular 5k route, our race followed the challenge course because there wasn't enough time to switch over the courses in between the races. Basically, we followed the same route as the official challengers, we just didn't have the character stops during our race. I was happy to see that the mile markers and inflatable start/finish line was still up- it made our race feel a little more special. Matthew and I ran this race using the same intervals we'd used all weekend; 30 seconds of running followed by 30 seconds of walking. About a quarter of a mile into the race, one of our table mates from dinner, Dameon, came up beside us. He'd just run the challenge race and was running the regular 5k as a bonus race! I lead us the majority of this race and I tried to push the pace during the run intervals. We ended the race with negative splits and an overall pace of 11:39- how's that for tired legs that just ran 39.3 miles in two days?! 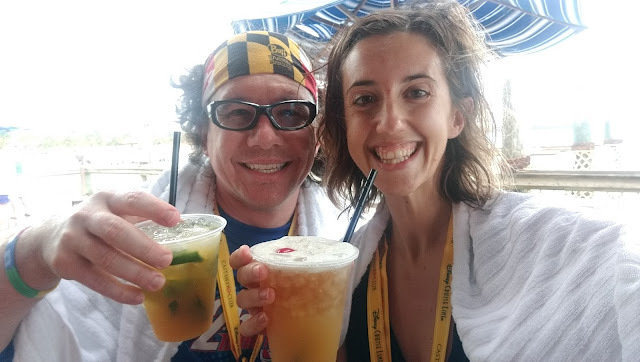 After the race, Matthew and I grabbed drinks at our favorite island spot, the Heads-Up Bar, and then took a ton of medal pics with the ship in the background. By then it had started pouring rain so we headed back to the ship earlier than we'd wanted to. All the creative points to Matthew for this shot. I will never tire of looking at this bling. Or this ship. Overall, did we miss not doing the official challenge race? Not one bit. 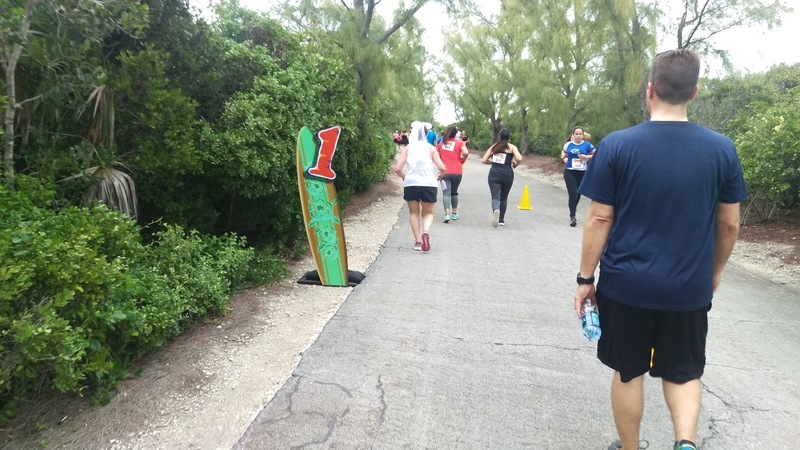 We had just as much fun doing the regular 5k and then enjoying the island. Will we do this race/cruise again? 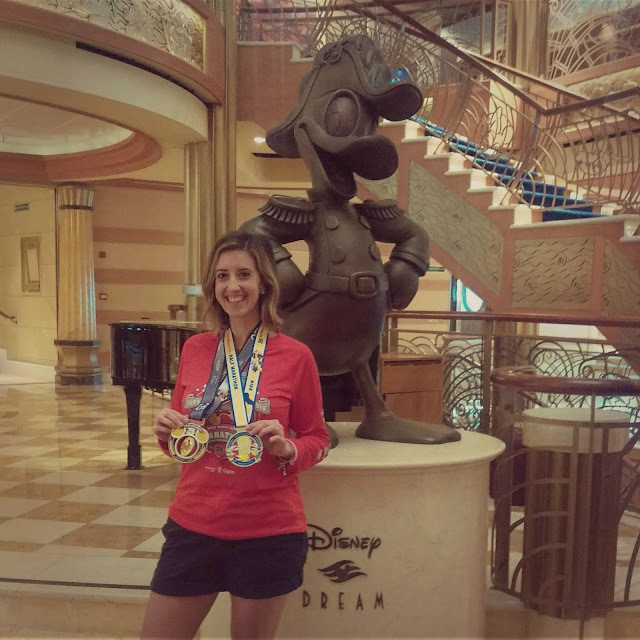 Stay tuned- I've got another recap coming with my overall thoughts on the whole WDW Marathon Weekend. I really want to do the Castaway Cay 5k! I didn't realize that the regular 5k is different than the challenge one. I don't think I will ever get to do the challenge 5k because I would never be able to take that much time off work in January.. boo! 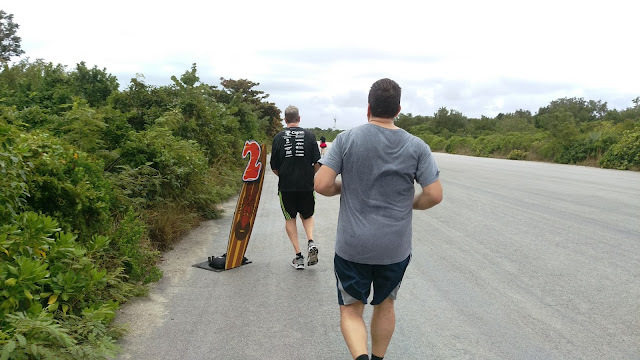 I'm headed to read your other blog post about the challenge race! PS: I use to read your blog often when I would read on Facebook. I hardly ever use FB anymore so I need to remember to add your blog to my blogger list. I like supporting local PA bloggers!